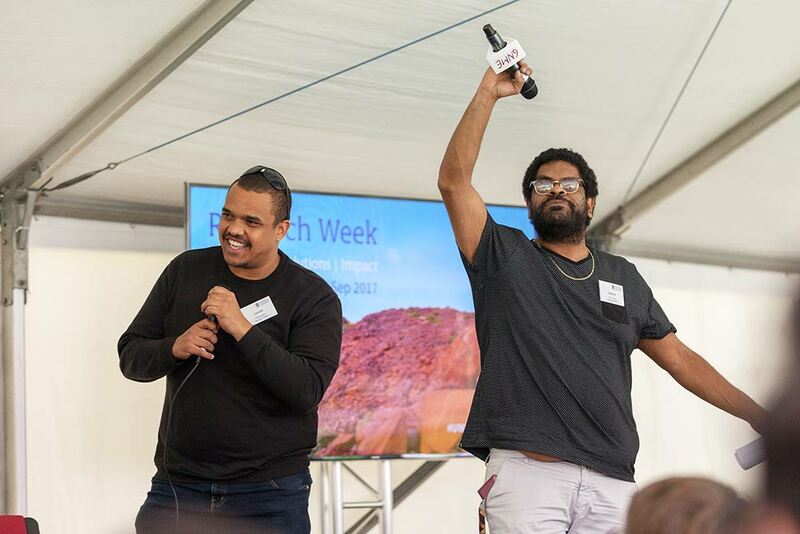 Perth’s hottest breakfast duo 100.9FM Noongar Radio’s 2 Norty Broz proved to be worthy contenders for Tony Jones’ ABC role when they broadcast their own live Q&A to launch The University of Western Australia’s Research Week on Monday 4 September. Discussing no less than the very origins of Aboriginal civilisation itself, Professor McDonald’s own recent research has uncovered evidence of Aboriginal occupation dating before and through the last ice age. Traditional music and cultural context was provided by the acclaimed Patrick Churnside, questions from the audience featured local high schools and university students and even live station ID’s by Elder Tootsie Daniels proving the highlight of the show, winning over all by saying “I also work with radio so I’ll do a little promo, you’re coming live from the UWA college here in Perth and you’re listening to Noongar Radio”. The forum was broadcast live from the grounds of The University of Western Australia. The 2 Norty Broz can be heard live Monday to Friday, 7-9am on 100.9FM Noongar Radio Perth.